So we were at home doing some cleaning about a week and a half ago when my wife pointed out a rather long snake making its way across the street and into our front yard. She, much like Indiana Jones, is not a big fan of snakes, and asked me to go out and kindly remove the creature. A request which I was more than happy to fulfill, since it gave me the chance to hearken back to my medieval forebears of knights in shining armor who rode gallantly into the face of danger to protect their homeland. Only instead of gauntlets I donned a pair of work gloves, and in the place of a lance I instead wielded a push broom and my DSLR camera. Same difference though, right? Anyway, I followed this snake around for about 10 minutes, coaxing him away from our house with the broom while snapping pictures with the camera. 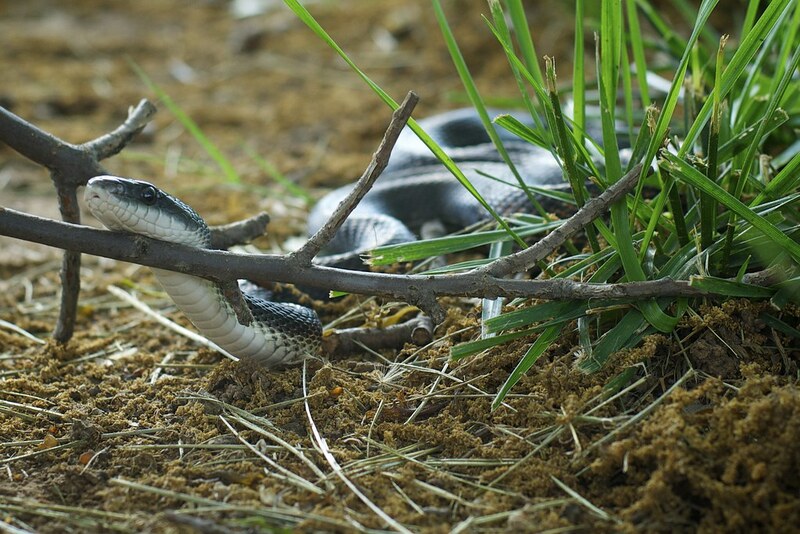 I didn’t know if it was a poisonous snake or not (found out later that this species, Elaphe obsoleta or “Rat Snake,” was not), and since I was using my 50mm lens I had to get uncomfortably close in order to get any good pictures. The stick in the foreground upon which this snake’s head is resting was actually thrown by me in order to encourage the slithering reptile to leave, but instead it was used as a photography prop–a decision which I can’t say was entirely disappointing. Eventually the snake did head on town the block, but it was not really due to me and my broom. Rather, a mockingbird decided that a snake in the yard was unacceptable, and flew down to help me out. It put on quite a show, dancing and flaring its wings while also pecking at its tail, and apparently the snake decided he had better just move on. And so did I, back into the house to help my wife finish reading books to our son.